Mission – Plant, grow and serve small workout groups for men for the invigoration of male community leadership. Be led by men who participate in the workout in a rotating fashion, with no training or certification necessary. You versus you. Modify or stop an exercise if you need to. The most important thing is that nobody gets hurt. We circled up in the parking lot of Shawn’s Irish Tavern at 2pm sharp. Weather was absolutely perfect. Low to mid 60’s with a very light breeze. The SkyQ blessed us today! These pairings would remain constant throughout the ruck. We headed out of Shawn’s parking lot with Doc Watson’s as our first way point. We traveled northeast on Heatherdown’s Blvd and Klinger and Mayor set a blazing pace! The PAX didn’t miss a beat and our formation stayed tight. 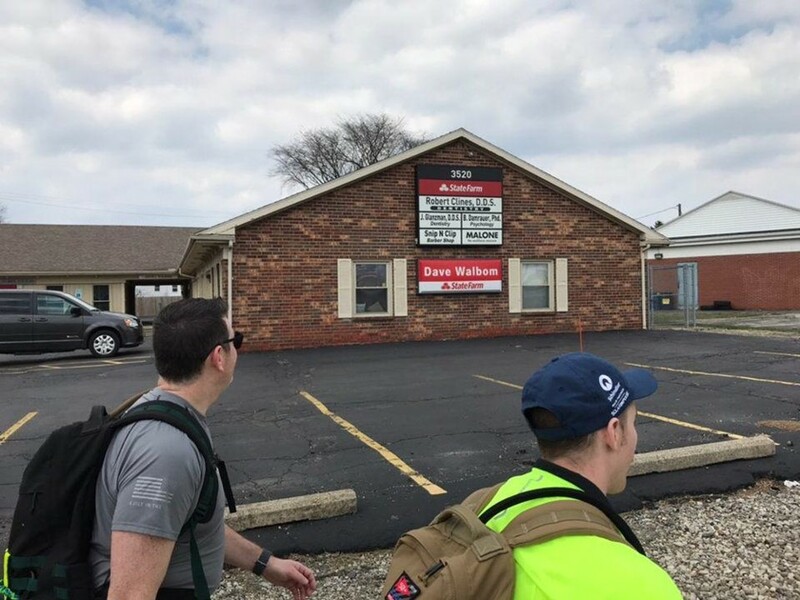 As we approached the intersection of Heatherdowns and Byrne we passed Flo’s (respect) insurance office and took a photo as the PAX rucked by. We missed Flo today and hope he gets better soon as he was under the weather and not able to attend the Pub Ruck. YHC instructed the PAX to turn right on Byrne Road and was quickly corrected by Stark that was not the correct direction. YHC was reminded of his directional deficiency numerous times by Bambi throughout the remainder of the ruck! As we approached Doc Watson’s we passed the bar to cross at the intersection and avoid playing Frogger across five lanes of Byrne Road. 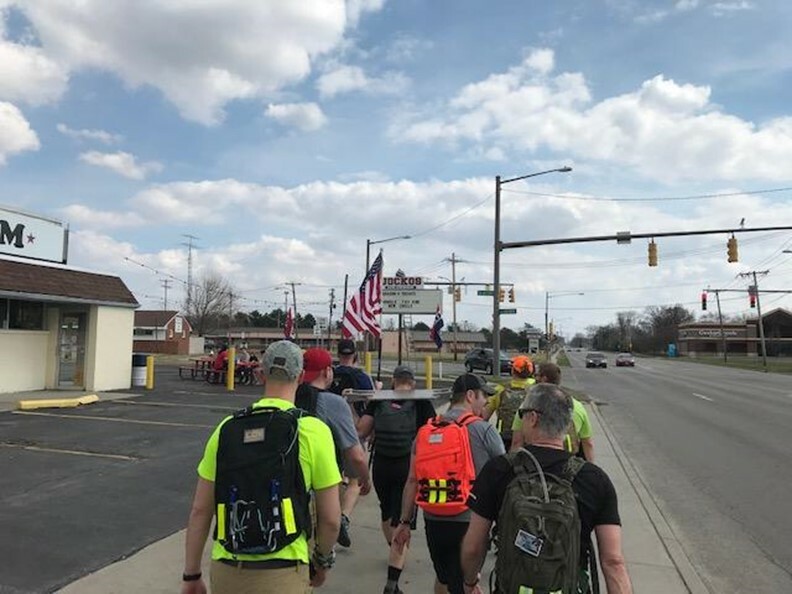 This added a little distance to our ruck but at the pace we were setting we needed more miles in order to stretch the event to the three-hour minimum. It also gave us a little extra time at each stop, which no one had an issue with. We entered Doc Watson’s parking lot and planted the shovel flag in a small mulch island near the entrance. We would have about 40 minutes at the bar, again due to our blistering pace and Bambi and Rhonda continued to ruck and get some miles in. After some initial stares from the bartenders and patrons we settled in at the bar area. We took off our packs and sat down for some rehydration. Waters all around and beers that ranged from Thumper’s “Can of the month” Miller High Life ($1.14 – it is the Champagne of Beers!) to IPA’s. TClaps to Stark for picking up the tab on the beers! Rhonda and Bambi joined us after getting their extra mile in and we had a few minutes remaining so a round of Miller High Life was ordered and drank quickly in order to get back on our route by 3:15. We circled up outside Doc Watson’s and YHC did a quick Count O Rama to make sure all were accounted for. We grabbed the flag and headed south on Byrne towards our next stop, Earnest Brew Works. 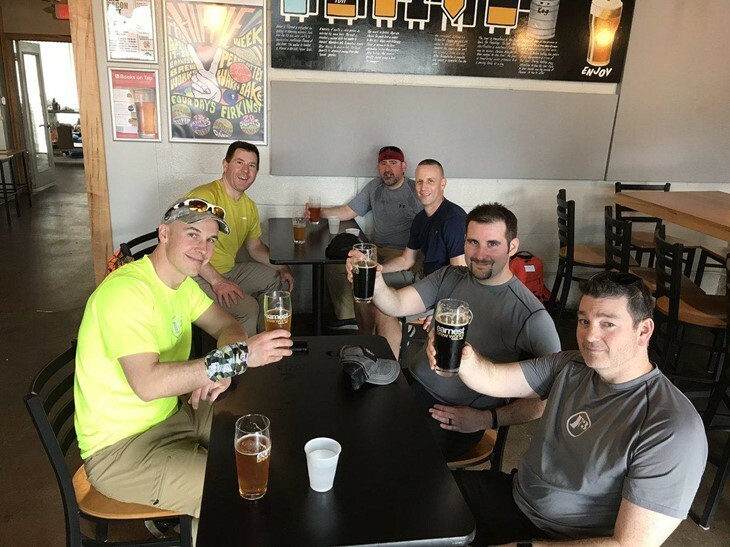 We continued our fast pace and covered the 1.8 miles to Earnest in under a half hour again giving us some extra time to enjoy, in YHC’s opinion the best craft brewery in NW Ohio. We planted the flag, took off our rucksacks and were warmly greeted at Earnest by smiling faces and wagging dog tails as Earnest is pet friendly! Mayor picked up the tab for the beers at Earnest which ranged from the easy drinking and aptly named “Easy” to the flavor packed double Oatmeal Stout “Big Oatis”. Bambi and Rhonda put in some extra miles and joined us after for a quick beer before we headed out towards our Endex. We now made our way back to Shawn’s and YHC again sent us in the wrong direction. Instead of the shorter 2.3-mile route we ended up taking the slightly longer 2.4-mile route back up Byrne Road to Heatherdowns. Again, this ended up being OK as we continued to move at a very quick pace, regardless of which pairing was at the front. We debated heading to The Distillery for a final beer however this would have put us over our official end time of 5pm. 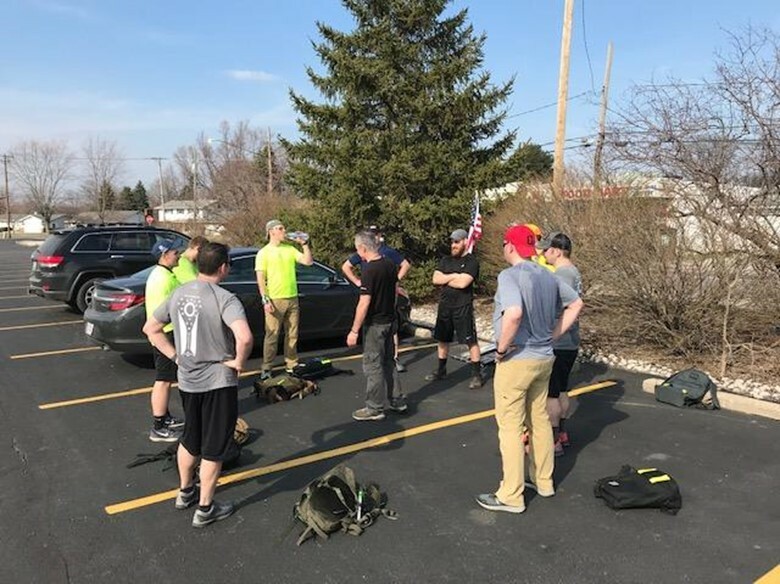 So, we decided to head back to Shawn’s and wrap up the ruck portion of the day and transition into the Winter Challenge Patch and awards presentation. Sharing of the six – TuPac. EH’d by Casper at Starbucks. 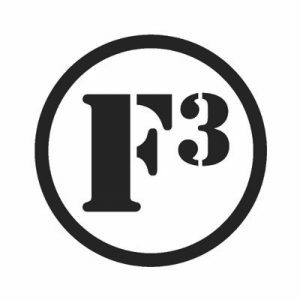 Posted to give F3 a try and has literally not stopped posting since that day. Got his name because during his naming at the first workout he told everyone that he was going through some “changes” in his life. Doesn’t really like to exercise but loves coming out for the fellowship and for everything that F3 has done for his life. Aye! 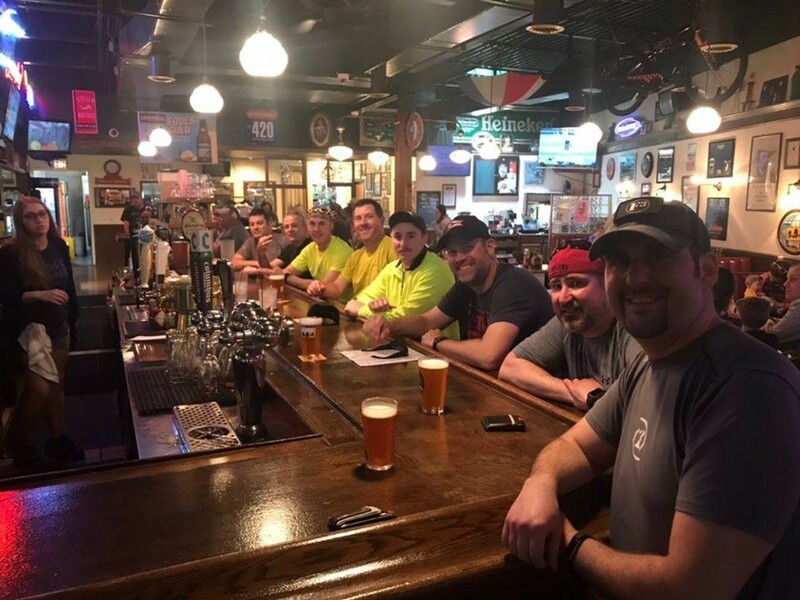 Ball of Man – Prayers for Bambi’s father-in-law, for Patriot and those going through job and career changes and for our F3 brothers dealing with marital and relationship issues. Thanks and praise to the SkyQ for the great weather, fellowship and this group of HIM’s who continue to amaze with their dedication to each other and to the community. We lost count of the number of car honks early, but a conservative estimate would be thirty+. TuPac and Stark completed quite a few air presses while carrying one of the coupons. Respect! Total miles covered: 6.6. Pace: Exactly 15:00. 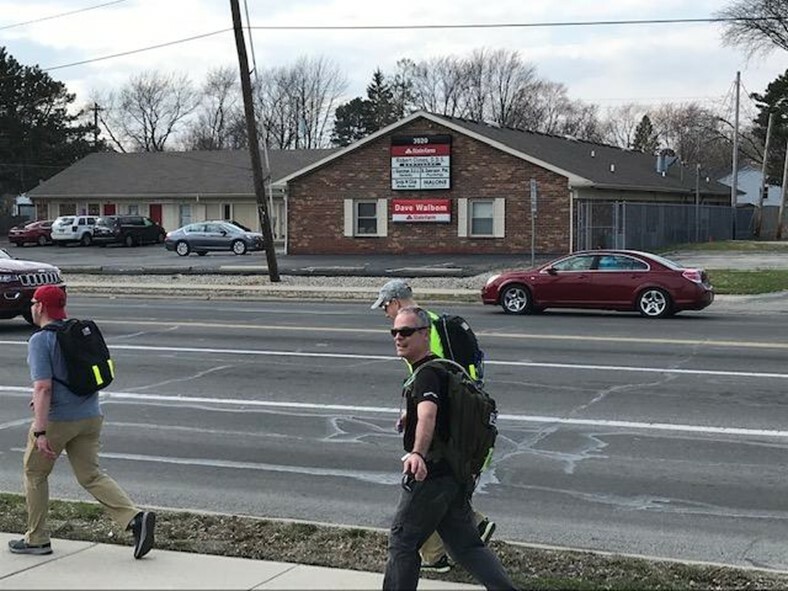 Great work by all to keep a four mile per hour pace for the entire ruck. We were UNDER 15min/mile for the final 2.4 miles stretch! Bambi and Rhonda rucked to and from the event! 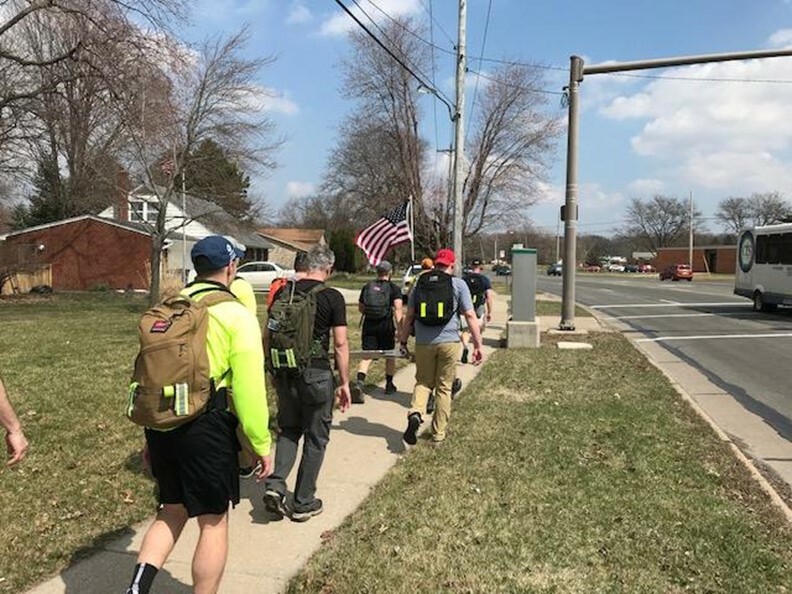 Combined with their 3-hour morning ruck, they covered over 25 miles today. Nice work men! Multiple times cars stopped along our route to ask what we were all about. One woman, who was in the military was very happy to see us out supporting the community. TuPac was in EH mode and talked to people at Doc Watson’s and Earnest about F3Toledo. YHC continually asked for the flag to be kept on the left thinking it has military significance as he heard Klinger direct someone at The Frog to keep the flag on the left. Bambi asked Klinger about this and there is no military significance when there is only one flag. As we talked about it, Klinger recalls the flag getting caught up in trees during The Frog and asked the flag to be moved to the left side to avoid entanglements. So there you have it! Service Project: Sports equipment donations were collected for Uplyft Toledo, a non-profit organization which aims to give all children in NW Ohio the opportunity to participate in fitness activities and enjoy the associated benefits. Items collected included basketballs, soccer balls, athletic shoes, baseball helmets and bicycle helmets from the awesome gals at FiA Toledo! 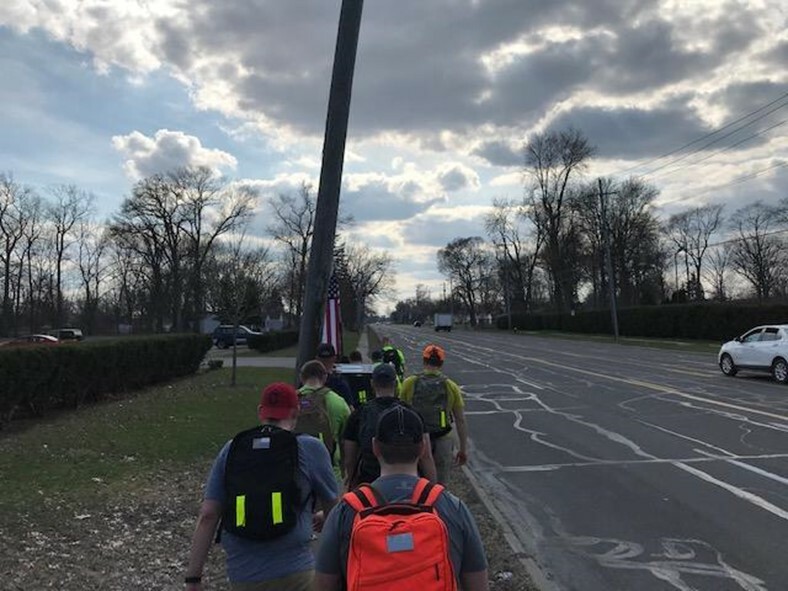 It was an honor to lead the monthly ruck! To get your money’s worth, this is a 6 hour event, but there is the opportunity to drop off or join up at 0900. 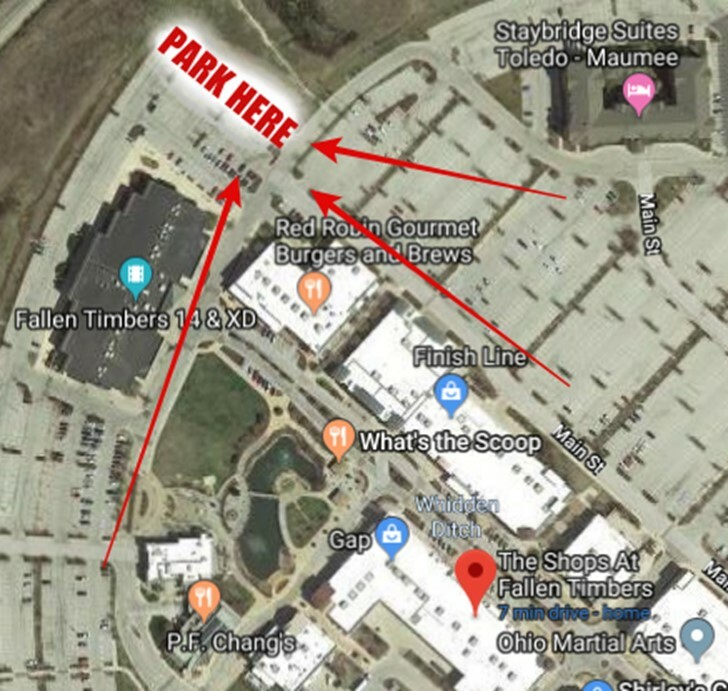 The event will begin and end in the parking lot to the north of the Cinemark Fallen Timbers Movie Theater at the Shops at Fallen Timbers. Those joining at 0900 must be ready to join the group at 0900. Park in the same spot. 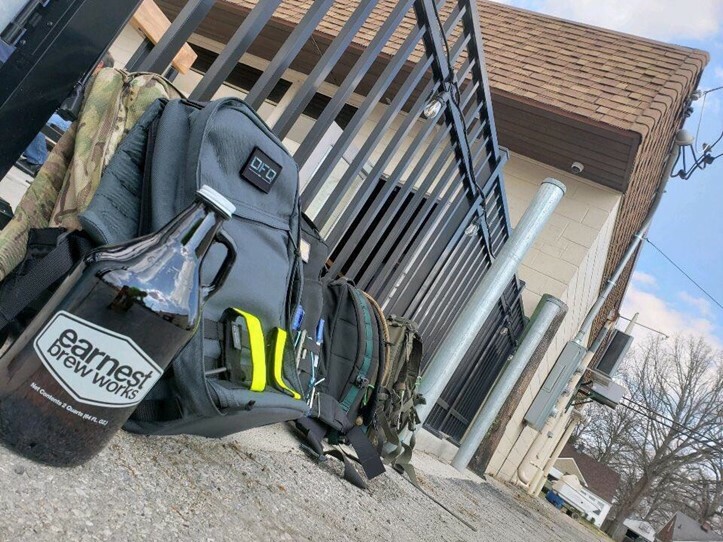 The purpose of this ruck will be to appreciate what our bodies can do and push them further. 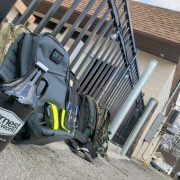 Total ruck distance will be between 10 and 15 miles for the entire 6 hours. The service project portion will be in support of a local charity, Braedan’s Bridge. Braedan is a 13 year old boy from Oregon, Ohio who was diagnosed with Duchenne Muscular Dystrophy in 2011. Duchenne affects 1 in every 3,500 male births. These boys become confined to wheelchairs in their teens, and typically never see their 21st birthday. There is no known cure. Braedan’s Bridge hosts an annual casino night at Sylvania Tam-O-Shanter in October to raise funds to find a cure for Duchenne. We will have the opportunity to learn how we can help volunteer or donate at the ruck.